This next car comes as a tip from Zach Z, who asks "So what would you swap into this shell and why?". The actual car doesn't look that bad, but the asking price is optimistic for something without an engine...but who am I to predict the future market value of a Hayabusa powered Triumph Stag?!? 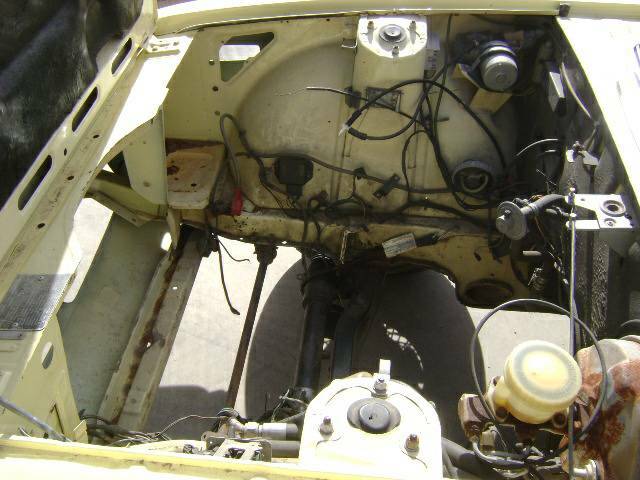 Find this 1971 Triumph Stag without engine offered for $4800 in Las Cruces, NM via craigslist. 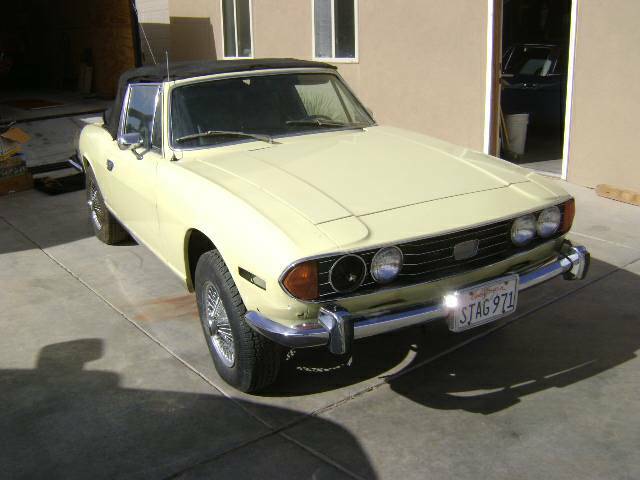 1971 TRIUMPH STAG, EXCELLENT BODY FROM CALIFORNIA, NO RUST EVER! NEEDS REPLACEMENT ENGINE. I HAVE SOME ENGINE PIECES BUT THERE IS NO BLOCK AND ONLY ONE CYLINDER HEAD. I HAVE OTHER ENGINE PACKAGE FOR SALE AT ADDITIONAL PRICE. ROVER V8 OR TR6 2.5 OR CHEVY OR FORD V8'S. NICE ORIGINAL INTERIOR , WILL NEED REPAIR TO DRIVER SEAT SEAM. EXCELLENT DASH, NO CRACKS OR FADING. PS. PB. P WINDOWS. REBUILT AUTO TRANS BW35. WIRE WHEELS. STAINLESS EXHAUST, CLEAN NEW MEXICO TITLE. I HAVE OTHER CARS TO FINISH AND MUST THIN THE HERD. What would you put under the hood? Comments below. Here's a fun article: Vintage Gas Guzzlers Riper for a Battery Powered Reboot - nice photos, pithy blether - Stag, Trabant, Scorpion, etc. 1970-78 Triumph Stag -- There is no list of world’s worst cars that fails to include the Triumph Stag. It’s a shame, really; the Stag’s reputation for reliability, or profound lack thereof, has obscured its aesthetic goodness, which is considerable. The big semi-convertible was created to compete with the vaunted Mercedes SL and, like most Triumphs of the era, arrived with a gorgeous shape penned by Giovanni Michellotti, whose previous efforts included the Ferrari 166 MM and the BMW 2002. It’s handsome from the outside and handsome from the inside, and it drives well, too. When it drives, that is. Unfortunately, the car’s Triumph-designed 3-litre V8 was a bona fide disaster, and as a result, the general public remembers the car in much the same way it remembers New Coke and Microsoft Bob. But there is a solution: excise that woeful engine, transmission and fuel system. What’s left? The good stuff. I'd go with a Rover V8 for the "what could have been" value. I actually saw this ad last week on CL and thought "I could be into making a bad decision today." Then I saw it didn't have a motor and realized just how bad of a decision this would be. OMG, what a shame! I'll bet the next time we see this For Sale (not long) it will have an LS in it. What a pity! Audi / Lambo V10, obviously.